All of the materials from Chapters 1 – 14A-Bis. Add the above vpatches and seals to your V-set, and press to ffa_ch14_barrett.kv.vpatch. Reader diana_coman recently observed that the OF_in parameter taken by certain procedures in FZ_Shift is not checked for validity, and — if abused by being given an oversized (i.e. wider than the given shiftness) value — could result in a garbage output. Her observation is entirely correct. And ideally, the range of OF_in would be constrained via a precondition. Unfortunately, Ada does not permit the use of preconditions in combination with inlining; and FZ_Shift routines are invoked in several costly inner loops, and absolutely must be subject to inlining. Therefore, it is impractical to actually verify the bit-width of OF_in on every invocation. It is, however, the case that these procedures are defined strictly for internal use in FFA, and hence do not constitute a danger to the operator. After giving the matter some thought, I took diana_coman’s suggestion and added comments to warn the reader of the potential rake he could step on if he were to insist on making direct use of FFA’s internal shift routines. I will take this opportunity to remind the reader that FFA is designed to be “safe if used as prescribed”: if it is invoked via the provided external interface, the promised semantics are guaranteed to apply. The only prohibited operations are ones which over- or under-run the FFACalc stack, demand a division by zero, or attempt to violate other FFACalc rules. (These will bring the program to an orderly stop, and warn the operator.) All other actions will produce arithmetically-correct outputs for the given inputs. However it is impractical on extant iron to make this guarantee for each of the internal components taken separately! This is why we want sane iron, with inexpensive bounds-checking instructions! But we do not have it yet. Hence, the reader who wishes to make use of FFA internals for some custom purpose of his own, must proceed with extreme caution. I have included the change in this Chapter. I have included the change in this Chapter. Thank you, reader mircea_popescu ! Now, let’s eat the meat of this Chapter. V Put the FFACalc and FFA version numbers on the stack. 0 2 Kelvin Versioning is in use. -- followed by FFA Program Version. The effect: FFACalc and FFA now have independent “Degrees Kelvin” versions — i.e. they are to decrement by one upon every published revision to each respective program. Observe that this constitutes a promise to the reader: no more than 255 changes to either FFACalc or FFA are to be published after this Chapter. In the quite unlikely event where a change is found to be required after a Kelvin version reaches zero degrees, it is expected that the program is to be renamed, Vtronically-reground, and some very pointed questions posed to the maintainer! 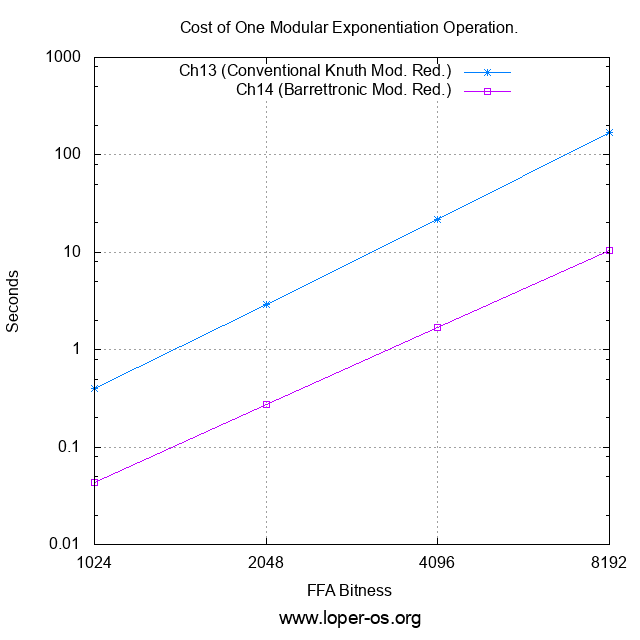 Now, let’s proceed to the originally-planned subject of Chapter 14B: the Ada implementation of Barrett’s Modular Reduction. Stop now and go back, study! Lest you become a danger to yourself and others. We will now discuss the Ada implementation of the Algorithm 2 given in Chapter 14A. Please print the Algorithm and the physical bounds proof and refer to these while reading this Chapter. Degenerate     : WBool;                    -- Is it degenerate case? -- Reduce N using the given precomputed Barrettoid. In every instance of the pre-computed Barrettoid data structure, we will keep everything which is required for Barrett’s Modular Reduction by a given modulus. In particular, we will retain ZXM: a zero-extended (for convenient use in steps 6 and 8) copy of the modulus itself; the parameter JM; the Barrettoid proper, BM; ZSlide, the number of bits we must right-shift Z by to compute ZS; and, finally, the degeneracy indicator, i.e. DM. Unsurprisingly, a Barrettoid is computed from a given modulus with the procedure FZ_Make_Barrettoid. All Barrettoids — like other FFA data — will exist as stack-allocations. (Heapism in any form whatsoever is forever banned in FFA.) And the only use of a Barrettoid is to compute Barrett’s Modular Reduction, using FZ_Barrett_Reduce. We will review both procedures in detail, below. The process may seem complicated, but it is merely a specialized form of FZ_Mod. With the difference that we are interested in the quotient, rather the remainder, and also wish to compute certain additional parameters corresponding to the given modulus. Recall that a Barrettoid BM for a given modulus M, was defined as the quantity ⌊2k / M⌋. In FZ_Make_Barrettoid, we compute it via Knuth’s division. Afterwards we record: the modulus itself; the quotient; whether the given modulus corresponds to the degenerate case M = 1; the parameter JM; and the parameter ZSlide. After this, the contents of the Barrettoid can be used to perform modular reduction modulo M in constant time. -- Reduce X using the given precomputed Barrettoid. Ml      : constant Indices := XReduced'Length; -- i.e. # of Words in Wm. -- ... finally, add ZsHiM to upper half of Q.
Sel => Bar.Degenerate); -- If Modulus = 1, then XReduced is 0. Notice anything unfamiliar? The astute reader will observe that the above is an exact implementation of the process described in Chapter 14A-Bis; the only new subcomponent is the FZ_Low_Multiply_Unbuffered routine used in Step 4. So let’s learn what it’s made of. -- "Low Multiplication" computes only the bottom half of the product XY. -- Presently, it is used solely in Barrett's Modular Reduction. -- L is the wordness of a multiplicand. Guaranteed to be a power of two. -- K is HALF of the length of a multiplicand. -- A 'KSeg' is the same length as HALF of a multiplicand. -- Bottom and Top K-sized halves of the multiplicand X. -- Bottom and Top K-sized halves of the multiplicand Y. -- Top K-sized half of the half-product XY. -- Carry from individual term additions. -- CAUTION: Inlining prohibited for Low_Mul ! FZ_Low_Mul_Comba, of course, is merely a cut-down Comba from Chapter 9; while the recursion is analogous to the one in Chapter 10's Karatsuba and Chapter 12's Square Karatsuba. Quite straightforward: we precompute the Barrettoid, and use it for all of the necessary modular multiplications and squarings modulo the given modulus. Now, the reader has probably read Dijkstra and recalls that "testing can reveal the presence of bugs, but never their absence." So why bother? The answer is, it is necessary to test your iron. It would appear that "the game was worth the candles" -- we now have (AFAIK: the first and only presently-published...) fully constant-time Barrettron. And it is one that (with reasonable effort on the reader's part) fits-in-head. In the next chapter, 15, we will begin to assemble the necessary ingredients for the generation of cryptographic primes. Please stay tuned! This entry was written by Stanislav , posted on Thursday December 27 2018 , filed under Ada, Bitcoin, Cold Air, Computation, Cryptography, FFA, Friends, Mathematics, ShouldersGiants, SoftwareArchaeology, SoftwareSucks . Bookmark the permalink . Post a comment below or leave a trackback: Trackback URL. Don’t they normally start asking pointed questions after the first rocket explodes during launch, rather than the 256th? The rocket is not the correct model here. 6000+ words to express what the The Hymn of Breaking Strain managed in its first verse, and even then only to software. Mr. Niquette must be sophisticated indeed. And recall how A. N. Whitehead managed to fill entire bookshelf with proof of “1 + 1 = 2″. This record, AFAIK, still unbroken. 103 xor 107 = ?